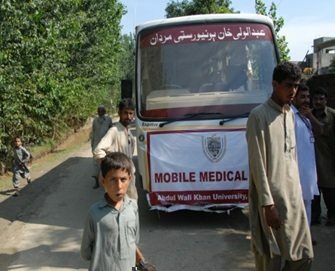 According to the mission statement of Abdul Wali Khan University, Mardan, the university aims to serve human beings through education regardless of race and color. The university has constituted several societies for civic engagement. These societies include Social Welfare Society, Anti Narcotics Society and Blood Donor Society. The university has its own Ambulance service fleet to cope with any kind of emergency or disaster. For example, after the monsoon rains in July 2010 brought devastation and destruction to the whole of Khyber Pakhtunkhwa, Abdul Wali Khan University, Mardan actively participated in rehabilitation process by arranging medical campus, facilitating mobile medical units and arranging shelter and food for the victims of flood. The students, faculty and administration actively participated in the relief activities.